Examine the reasons why some sociologists choose not to use experiments when conducting research. Firstly, sociologists use laboratory experiments. Once a Laboratory experiment has been conducted other scientists can replicate it. This makes laboratory experiments highly reliable as they are replicable. The laboratory experiment has major advantages as the method can be used to establish cause and effect relationships. For this reasons positivist sociologists use laboratory experiments as they favour a more scientific method. 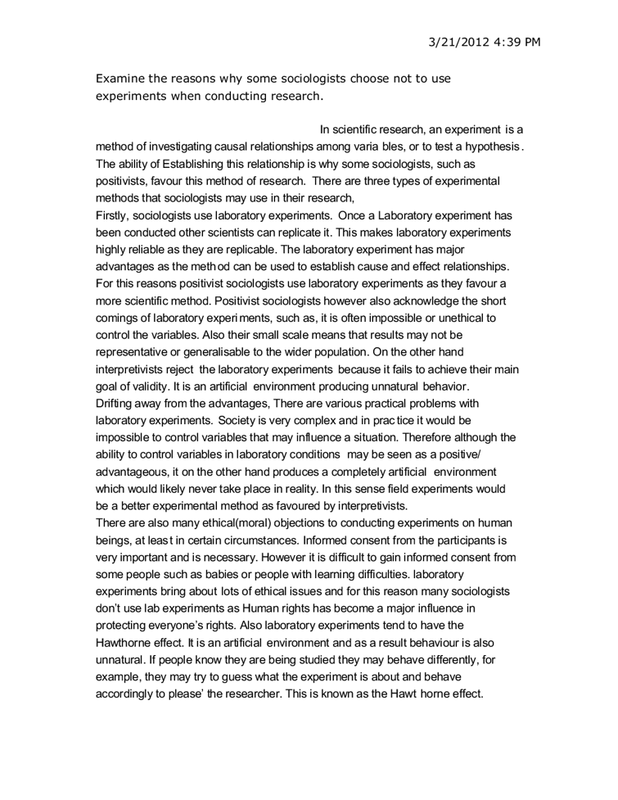 Positivist sociologists however also acknowledge the short comings of laboratory experiments, such as, it is often impossible or unethical to control the variables. Also their small scale means that results may not be representative or generalisable to the wider population. On the other hand interpretivists reject the laboratory experiments because it fails to achieve their main goal of validity. It is an artificial environment producing unnatural behavior. Drifting away from the advantages, There are various practical problems with laboratory experiments. Society is very complex and in practice it would be impossible to control variables that may influence a situation. Therefore although the ability to control variables in laboratory conditions may be seen as a positive/ advantageous, it on the other hand produces a completely artificial environment which would likely never take place in reality. In this sense field experiments would be a better experimental method as favoured by interpretivists. There are also many ethical(moral) objections to conducting experiments on human beings, at least in certain circumstances. Informed consent from the participants is very important and is necessary. However it is difficult to gain informed consent from some people such as babies or people with learning difficulties. 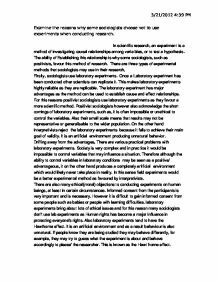 laboratory experiments bring about lots of ethical issues and for this reason many sociologists don’t use lab experiments as Human rights has become a major influence in protecting everyone’s rights. Also laboratory experiments tend to have the Hawthorne effect. It is an artificial environment and as a result behaviour is also unnatural. If people know they are being studied they may behave differently, for example, they may try to guess what the experiment is about and behave accordingly to please’ the researcher. This is known as the Hawthorne effect. Interpretivist sociologists, such as interactionists, argue that human beings are different from plants, animals, rocks and other things used in experiments. Unlike them we have free will, consciousness and choice. This means our behaviour cannot be explained in terms of cause and effect but in terms of the choices we make freely. Given these problems with laboratory experiments, sociologists, such as interpretivists, favour field experiments. Unlike laboratory experiments field experiments take place in a natural enviroment rather than an artificial enviroment. Behaviour is therefore more likely to be natural as well. Also those involved generally don’t know they are the subjects of an experiment, in which case there is no Hawthorne effect. However this could be very unethical. In field experiments however we have no control over variables, so even though it’s a natural environment there is a high risk of the experiment going wrong. In conclusion, it could be argued experiments, whether field or lab are a vital part in sociological research. Each having their own strengths and weaknesses depending on the research required. It could be argued experiments are a reliable method of research and is a key form of research when cause and effect relationships are required. Examine the reasons why sociologists choose to use secondary sources when conducting research. Furthermore secondary data can be high in representativeness especially official statistics on education. For example all state schools have to complete a school census three times a year. This collects information on pupil's attendance, gender and so on. These statistics cover virtually nearly every pupil in the country, they are highly representative. relate to my research proposal because they use qualitative data and because they look at household prices, young people and household formation. I have got a good grasp of the methods used in the Joseph Rowntree Foundation research, using the electoral register was a good way to gather a sample for that particular research, in my opinion. This is illustrated clearly in Durkheim?s study of suicide where he compared the suicide rates across different European countries and across time. This large-scale quantitative data enabled Durkheim to see that there were consistently different rates in different countries and he was able to come up with social reasons for these suicide rates.